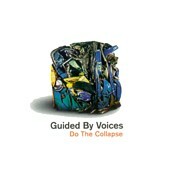 Do the Collapse Album reviews. For the entire 13 years of his band's existence, GBV have continued to be the first and foremost in combining the "lo-fi" sound with '60s pop influences and lyrics that make absolutely no real sense. But their albums, though full of good ideas, have resembled less of a musical statement and more of a catalog - until now. Lead vocalist and songwriter Robert Pollard has brought in a ringer - ex-Cars leader Ric Ocasek - to produce Do the Collapse and play the occasional keyboard, and he couldn't have made a better choice; the results are astounding. Not only have Guided By Voices made their most accessible album ever, but they've done it without even an ounce of mainstream concession. Back in his days with the Cars, Ocasek was often struggling with his bandmates and record label on these exact issues. For the most part, he lost - although no one can argue with all the great pop the Cars made, it was a band that often sacrificed its desire to take a few more risks with its music at the expense of the big hit. Do the Collapse is, one would imagine, exactly the sort of record Ocasek would have wanted to make. In fact, the insistent guitar wall of sound that opens "Mushroom Art" bears more than a passing resemblance to the Cars' "Strap Me In," but this is still very a much a Guided By Voices album. The lo-fi vibe remains, but the band sounds far more proficient. Pollard's eerie voice remains, but the occasional sense of "Look ma, I've made a record!" has been replaced by the certainty of listening to a professional songwriter. The odd titles and obscure images remain, but they sometimes actually mean something. The 30 second patches of potentially good ideas for 3 minute songs are now 3 minute songs themselves. it's as if the old Guided By Voices (still very much worth listening to, incidentally) were struck by lightning and instantly given the power to capitalize on their dreams. So what are the clever pop concoctions that Pollard has finally made? For starters, there's the paranoid angst of "Teenage FBI" - "Someone tell me why / I do the things that I don't wanna do?" Then there's the grunge-ish "Liquid Indian," and "Optical Hopscotch," both holding their own with most soft-verse, loud-chorus anthems this decade has become famous for. There's the mockingly cheesy torch ballad "Hold On Hope," equally inspirational and ridiculous. There's the infatuation imagery of "Wrecking Now," which in an alternative world would be playing in the background during a 'meaningful' teen drama show. Best of all is "Surgical Focus," a psychedelic rocker with a wild, unpredictable but impeccably crafted melody that's as near perfect as most mere pop songs get - it begins "With surgical focus / she stared at me and said / I'm willing to reach out / get into your head" and end with "Climbing high upon the rocky cliffs / we fly with surgical focus." The album ends with the somewhat biographical "An Unmarketed Product," and the warning "Well, I can give you credit� and if you have any luck, you'll get ahead before you're dead." How can you not love this irony? What else can be emphasized save for a reassurance that GBV has not 'sold out' in any sense. Rather, they have, as the album title suggests, done the collapse into a thinking person's pop band; intelligent, incisive, and focused. Surgically focused.